The Edelweiss is a three star guest house in the heart of Douglas, Isle of Man. The central location in the island's capital and the wonderful sea view makes the Edelweiss the ideal accommodation in the Isle of Man, open all year around to cater for your needs. The guest house has 18 comfortable rooms with en-suite bathroom, flat screen TV, Wi-Fi, central heating and direct dial telephone. In the heart of Armagh city, 18th-century De Averell Guest House offers free Wi-Fi and free secure parking. The Mall is just a 5-minute walk away. Each spacious en suite room at De Averell has satellite TV. The hosts are friendly and hospitable. This stylish, family-run guest house is close to Edinburgh city centre and has easy access by bus. 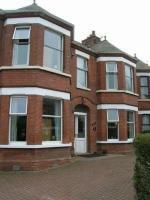 It has free parking, free Wi-Fi and attractive rooms with Freeview TVs and DVD players. The Southside Guest House is a mile (1.